"As Hard Rock continues to expand globally, our focus will be influential cities with deep musical roots," states Todd Hricko, senior vice president, head of global hotel development for Hard Rock International. "Home to a unique melting pot of cultures, New Orleans — known for its nightlife and vibrant live-music scene – has been a desirable choice for our next Hard Rock Hotel." 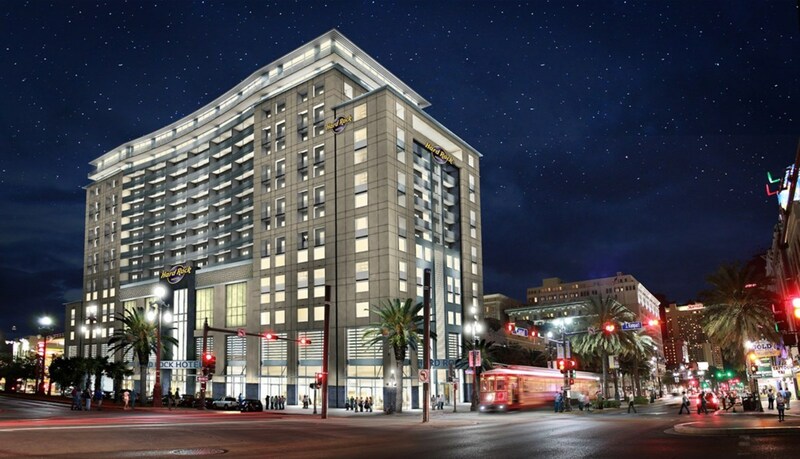 Accommodating both business and leisure travelers, Hard Rock Hotel New Orleans will offer 350 rooms for hotel guests, in addition to 62 one, two and three-bedroom units available for purchase beginning in the spring of 2018. Almost every room offers unparalleled views and a balcony or terrace overlooking the city, including Canal-facing parade-route suites. With Hard Rock boasting the world's largest music memorabilia collection, which now includes more than 80,000 legendary and priceless items, walls throughout the property will be adorned with pieces to fit the local music scene while paying homage to the city's historic background. The property will also boast four dynamic meeting spaces along with two ballrooms, totaling approximately 12,000 square feet of prime event space. "We feel privileged to partner with Hard Rock International to bring this exciting development to the French Quarter. Our goal is to host New Orleans' great traditions of music and cuisine through fine dining, entertainment, and rooftop venues. We are excited to share the Hard Rock experience, and we're sure it will soon become a favorite for locals and visitors alike," shared Mohan Kailas, founder of Kailas Companies. Regionally-inspired food and beverage offerings will be available on-site, such as a three-meal all day dining option, a grab-and-go option, and a pool bar and grill. The property will also boast an upscale restaurant that will be quickly known for its authentic Louisiana seafood, offering low key music, ridiculously good drinks, and a place where tradition and tales are shared and celebrated. Guests can enjoy drinks at the property's exclusive lobby bar, as well as enjoy a refreshing spiked snow ball on-site from the famed Pitard's Adult Snowballs. Plans also call for an exclusive rooftop sky bar and lounge, providing the premier hotspot for remarkable 360-degree views of the city and inspiring culinary offerings. In true Hard Rock style, the hotel will offer music-based experiences available through brand-wide amenities and programs, including access to the Rock Shop®, where guests will be able to purchase iconic Hard Rock merchandise, as well as Sound Body wellness experiences, such as a fully-equipped Body Rock® workout facility and Rock Om®, a one-of-a-kind in-room yoga experience that energizes the body and soul through the power of music. Also available will be the brand's signature Sound of Your Stay® amenity program, which is an interactive music experience enjoyed from the comfort of one's room. As an added bonus, hotel guests can indulge in VIP services typically reserved for musical legends on the eighth floor's Rock Royalty Level and Lounge. To learn more about residential sales, please visit www.ResidencesAtHRHNewOrleans.com. With venues in 75 countries, including 180 cafes, 24 hotels and 11 casinos, Hard Rock International (HRI) is one of the most globally recognized companies. Beginning with an Eric Clapton guitar, Hard Rock owns the world's greatest collection of music memorabilia, which is displayed at its locations around the globe. Hard Rock is also known for its collectible fashion and music-related merchandise, Hard Rock Live performance venues and an award-winning website. HRI owns the global trademark for all Hard Rock brands. The company owns, operates and franchises Cafes in iconic cities including London, New York, San Francisco, Sydney and Dubai. HRI also owns, licenses and/or manages hotel/casino properties worldwide. Destinations include the company's two most successful Hotel and Casino properties in Tampa and Hollywood, FL., both owned and operated by HRI parent company The Seminole Tribe of Florida, as well as other exciting locations including Bali, Cancun, Ibiza, Las Vegas, and San Diego. Upcoming new Hard Rock Cafe locations include St. Petersburg, Cairo, Wroclaw and Chengdu. New Hard Rock hotel, casino or hotel-casino projects include Atlanta, Atlantic City, Berlin, Budapest, London, Los Cabos, Maldives, New York City, Ottawa, Dalian and Haikou in China. For more information on Hard Rock International, visit www.hardrock.com.